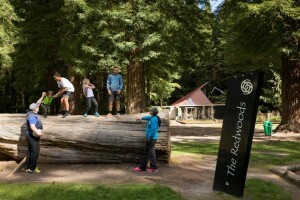 Originally opened as a forestry information centre in 1978, the now ‘Redwoods Visitor Centre and i-Site’ offers forest information and much more to help you make the most of your forest experience. The friendly staff can provide information on all recreational activities, up to date information on tracks and forestry operations, and offer advice and local knowledge not only about the forest but about other recreational opportunities and attractions around Rotorua. As an i-Site they also provide a booking service for attractions around Rotorua, buses and the ferry crossing. It is also an ideal place to stock up on refreshments and snacks for your adventure, with barista coffee and smoothies also on offer. A visit to i-SITE on arrival to the Redwoods will help you uncover the hidden gems that will make your visit truly memorable and is your one-stop shop during your time in Rotorua.